Definition at line 1246 of file iterative_linear_solver.h. Definition at line 1252 of file iterative_linear_solver.h. 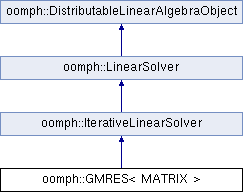 References oomph::GMRES< MATRIX >::Iteration_restart, and oomph::GMRES< MATRIX >::Preconditioner_LHS. Definition at line 1262 of file iterative_linear_solver.h. Definition at line 1268 of file iterative_linear_solver.h. Definition at line 1533 of file iterative_linear_solver.h. Definition at line 1371 of file iterative_linear_solver.h. References oomph::GMRES< MATRIX >::Matrix_can_be_deleted, and oomph::GMRES< MATRIX >::Matrix_pt. Referenced by oomph::GMRES< MATRIX >::disable_resolve(), and oomph::GMRES< MATRIX >::~GMRES(). Definition at line 1352 of file iterative_linear_solver.h. Definition at line 1280 of file iterative_linear_solver.h. References oomph::GMRES< MATRIX >::clean_up_memory(), and oomph::LinearSolver::disable_resolve(). Definition at line 1345 of file iterative_linear_solver.h. References oomph::GMRES< MATRIX >::Iteration_restart, and oomph::GMRES< MATRIX >::Restart. Taken from: Saad Y. "Iterative methods for sparse linear systems", p.192. Definition at line 1475 of file iterative_linear_solver.h. Definition at line 1337 of file iterative_linear_solver.h. Definition at line 1331 of file iterative_linear_solver.h. Definition at line 1274 of file iterative_linear_solver.h. Definition at line 2162 of file iterative_linear_solver.cc. Definition at line 1358 of file iterative_linear_solver.h. Definition at line 1361 of file iterative_linear_solver.h. Definition at line 2191 of file iterative_linear_solver.cc. References oomph::DoubleVector::build(), oomph::DoubleVector::built(), oomph::Problem::communicator_pt(), oomph::DistributableLinearAlgebraObject::distribution_pt(), oomph::Problem::get_jacobian(), oomph::Problem::ndof(), oomph::oomph_info, oomph::DoubleVector::redistribute(), and oomph::TimingHelpers::timer(). Definition at line 1293 of file iterative_linear_solver.h. References oomph::DistributableLinearAlgebraObject::build_distribution(), oomph::DistributableLinearAlgebraObject::distribution_pt(), oomph::LinearSolver::Enable_resolve, oomph::GMRES< MATRIX >::Matrix_can_be_deleted, oomph::GMRES< MATRIX >::Matrix_pt, oomph::GMRES< MATRIX >::Resolving, and oomph::GMRES< MATRIX >::solve_helper(). Definition at line 1319 of file iterative_linear_solver.h. Definition at line 2272 of file iterative_linear_solver.cc. References oomph::DoubleVector::build(), oomph::DoubleVector::built(), oomph::LinearAlgebraDistribution::distributed(), oomph::DistributableLinearAlgebraObject::distribution_pt(), i, oomph::DoubleVector::initialise(), oomph::BlackBoxFDNewtonSolver::Max_iter, oomph::DoubleMatrixBase::multiply(), oomph::DistributableLinearAlgebraObject::nrow(), oomph::oomph_info, s, oomph::Global_string_for_annotation::string(), oomph::TimingHelpers::timer(), and oomph::DoubleVector::values_pt(). Referenced by oomph::GMRES< MATRIX >::solve(). Helper function to update the result vector using the result, x=x_0+V_m*y. Definition at line 1381 of file iterative_linear_solver.h. References oomph::DistributableLinearAlgebraObject::distribution_pt(), i, oomph::DistributableLinearAlgebraObject::nrow(), oomph::GMRES< MATRIX >::Preconditioner_LHS, oomph::IterativeLinearSolver::preconditioner_pt(), oomph::Preconditioner::preconditioner_solve(), and oomph::DoubleVector::values_pt(). Definition at line 1553 of file iterative_linear_solver.h. Referenced by oomph::GMRES< MATRIX >::disable_iteration_restart(), oomph::GMRES< MATRIX >::enable_iteration_restart(), oomph::GMRES< MATRIX >::GMRES(), and oomph::GMRES< MATRIX >::iteration_restart(). Definition at line 1546 of file iterative_linear_solver.h. Referenced by oomph::GMRES< MATRIX >::iterations(). Definition at line 1564 of file iterative_linear_solver.h. Referenced by oomph::GMRES< MATRIX >::clean_up_memory(), and oomph::GMRES< MATRIX >::solve(). Definition at line 1556 of file iterative_linear_solver.h. Definition at line 1568 of file iterative_linear_solver.h. Referenced by oomph::GMRES< MATRIX >::GMRES(), oomph::GMRES< MATRIX >::set_preconditioner_LHS(), oomph::GMRES< MATRIX >::set_preconditioner_RHS(), and oomph::GMRES< MATRIX >::update(). Definition at line 1560 of file iterative_linear_solver.h. The number of iterations before the iteration proceedure is restarted if iteration restart is used. Definition at line 1550 of file iterative_linear_solver.h. Referenced by oomph::GMRES< MATRIX >::enable_iteration_restart().